You took a break from your popular Wind River Mystery series to write last year's Blood Memory. What was it like to come back to familiar characters after creating a whole new cast of characters in a different placeDenver, instead of the Wind River Reservation? I certainly wasn't finished with Father John O'Malley and Vicky Holden when I decided to write Blood Memory. But I think writers need to stretch themselves and try new things, and that's what I wanted to do. But there is still a lot to explore in the characters of Father John and Vicky, and it was wonderful to get back to thema bit like catching up with old friends. I turned on my computer and said, "Well, what have you been up to lately?" Solving two murders, actually, separated by nearly a century. The murder of a young Arapaho whose body is found on the frozen banks of the Little Wind River, and the disappearance and murder of his great-grandfather in 1923 in Hollywood. Hollywood? Tell us about it. This is a story I had wanted to write for a long time. Arapahos and Shoshones from the Wind River Reservation played the Indians in numerous silent Westerns in the 1920s, and they are proud of their Hollywood connection. I wanted to tell a story that had a sense of what that must have been likeIndians from a reservation transported into a crazy, anything-goes town in the 1920s when prejudice and stereotypical views of Indians practically dripped off white people. 300 Arapahos and Shoshones starred in the first western epic, The Covered Wagon. The making of that film is at the heart of the plot. There they were, playing themselves or, at least, playing the kind of Indians the director thought they should be, out in the desert of Nevada. Then fifty Shoraps camped in tipis on Cahuenga Pass and rode their ponies down into Hollywood along today's Hollywood Freeway to promote the movie every night at Grauman's Egyptian Theater. What a great story to build a mystery around. The plot goes back and forth in time between the 1920s and the present. Do we get to visit 1920s Hollywood? Oh, yes, and some of the grand old characters make an appearance: Cecil B. DeMille, Jesse Lasky, James Cruze, the director, and the great old cowboy star, Tim McCoy, who plays a major role. There is a main character that I call, Missy Mae Markham. Fans of the era will figure out that she is loosely based on Mary Miles Minter, one of Mary Pickford's rivals. You say that one of the Arapahos disappeared and was murdered? Only in the novel. Fortunately, all the Arapahos and Shoshones survived their movie experiences. But I asked myself, what might have happened if an Arapaho hadn't come home? What if the family was told by everyonethe police, the studiosthat he had simply walked away? 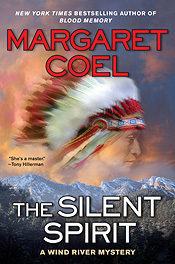 What if they persisted in believing he had been killed, and what if his great-grandson goes to Hollywood to find the truth and is murdered after he returns to the reservation? What would be the connection between two murders separated by nearly a century? In other novels Wife of Moon and The Girl with Braided Hair come to mindyou also interweave the past and the present by setting parts of the novel in the past. What appeals to you about this way of storytelling? Well, as a never-recovered historian, I'm fascinated with and addicted to the past. I like plots that show how the past percolates into the present in surprising ways and still matters. A past crime that leads to a crime today the never-slaked quest for justice, the desire for revenge that grows through the yearsseems like a natural plot for the mystery novel. Tell us about the research you did for The Silent Spirit. Read a lot of books on early Hollywood, and that was great fun. Amazon still sends me emails about the newest Hollywood booksthey think that's all I read! Also watched a lot of DVDs of silent westerns starring the Arapahos and Shoshones, especially The Covered Wagon, still a pretty good movie. Since Vicky goes to Hollywood in the story, I spent time in Hollywood, going to the museums, touring Grauman's Chinese and Egyptian theaters, and lunching at Musso and Frank Grill on Hollywood Boulevard, just as Vicky does. So did all the stars of the 1920s. Of course I visited with friends on the reservation and listened to wonderful stories of their ancestors going off to Hollywood, which helped to fill in a sense of what it must have been like. Another Wind River novel with Father John and Vicky, on which I am hard at work. Untitled at the moment. But Catherine McLeod from Blood Memory is rattling around in my brain, saying, "How about me?" So I think I'll have to let her have another story.